Thank you to all who participated in Nursing Shark Tank! At Nursing Shark Tank, nurse researchers tried to convince our audience – the Sharks – to give them the funding they need to turn their projects into reality. Sharks are venture philanthropists working to ensure that the UW continues its work to make the world a better place, and further prove that Together, we are boundless. Thank you to all who participated in our version of the television show and support our spirit of entrepreneurship and scientific research! 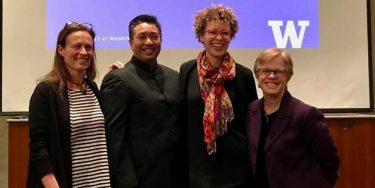 Dr. Sarah Gimbel, assistant professor in the Department of Family and Child Nursing and adjunct assistant professor in the Department of Global Health, was voted the winning presenter and received $10,000 in funding for her project. She introduced Sharks to her exciting work in Peru, where she has been working since 2009 with her presentation Bringing Global Lessons Home: Gardens, Pathways and the Microbiome. Sharks heard four presentations by UW School of Nursing faculty members. These faculty members have projects that have the potential to change the world. They only need funding. The presenters tried to convince the Sharks to give them the funding they need to advance their projects and be a world of good. Dr. Wendy Barrington, assistant professor of Psychosocial and Community Health and an adjunct assistant professor in Epidemiology, presented a her project, Transforming Nurses Through Service Learning. Dr. Betty Bekemeier, professor of Psychosocial and Community Health, adjunct associate professor of Public Health and director of the Northwest Center for Public Health Practice presented on PHAST: Public Health Activities & Services Tracking. Dr. Butch de Castro, the associate dean for Diversity, Equity and Inclusion and professor of Psychosocial and Community Health, introduced an outreach program to help increase outreach efforts to a diverse population. This event is made possible by the David B. and Jody Evans Smith Endowment for Innovation in Nursing and gifts from generous donors, without whom the event would not be possible. Please join them in providing seed money and award for innovative research, education and practice projects. If you attended the Nov. 8, 2017 Nursing Shark Tank event, we would like to hear from you! Please provide feedback and suggestions so that we can make the next Nursing Shark Tank even better.